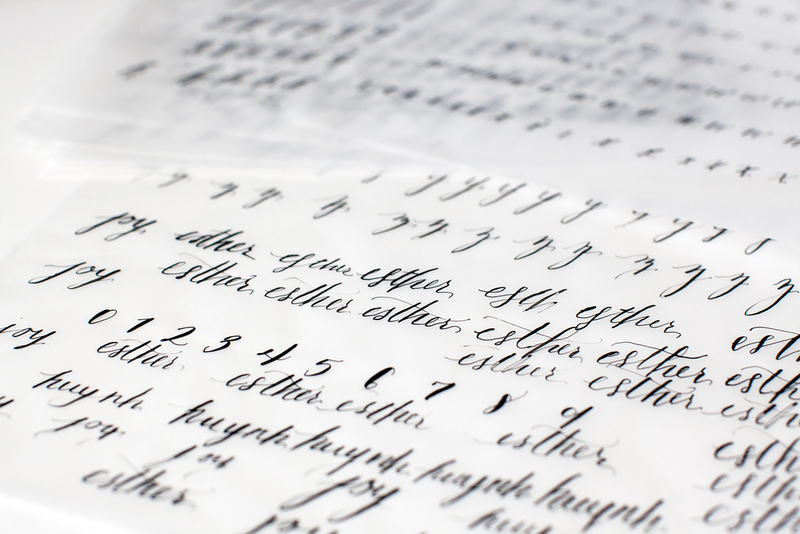 I've always been obsessed over calligraphy - since my early days working at a Paper store. I've loved the unique hand of the artist - how each person can tweak a line or letter to make it truly their style. The way you can transform an invitation just by simply dramatizing the strokes of the alphabet. For our birthdays, my sister and I bought each other a calligraphy class taught by the famous Lauren Essl of Blue Eye Brown Eye Calligraphy. I've heard nothing but great things about her and her workshops and let me just say - the class was so much fun. She provided everything for us and we showed up in the cutest studio space. She had calligraphy goodies for us ready to begin our class with. And she broke down the basics for us so thoughtfully and carefully that you could tell she had been doing this for awhile. Six years in fact. My favorite part about the class was actually learning that the name stems from one of her dogs. (See picture at the end of this post) After the class, I couldn't sleep. I wanted to practice. So I up down thin thick curve loop - I practiced until my hand cramped up and it was getting late. Now, I'm kind of obsessed. Taking this class just fueled the fire in my paper heart. I LOVE Calligraphy. If you get the chance, just WATCH her write. It's so effortlessly beautiful. I'm pretty proud of myself. Can you guess which one is my best? It's the one where the "t" is flawless. It's a pretty big deal lol for me.